The search to buy or sell luxury properties begins with the right broker. Christie’s International Real Estate has made that selection process easier for you. Only the most accomplished real estate brokers at the top of their markets are invited to join the Affiliate network. We undertake an exhaustive vetting procedure, examining all aspects of their business, their history, their character, and their potential. Once we determine that a broker is a leader in their field, exceeds our stringent service standards, and demonstrates a proven record of success, they are awarded the Christie’s International Real Estate Affiliate status, entering into a formal contractual relationship. Contact a luxury real estate broker who is qualified to help you market your property successfully or find you the ideal home. Rich with striking photography, elegant design, and engaging descriptions, Christie’s International Real Estate magazine is a keepsake publication. Produced four times a year, the magazine reaches approximately one million readers annually. A targeted mailing list ensures that each issue is sent to individuals of exceptional means, including the world’s wealthiest homeowners, international entrepreneurs, business leaders, and celebrities. 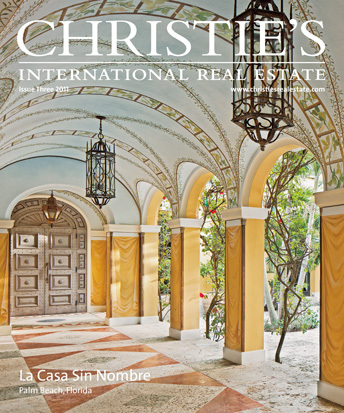 Christie’s International Real Estate magazine is available at newsstands, fine bookstores, fashionable hotels, private airport lounges, and Affiliate offices across the world. It is also distributed at important Christie’s auctions in cities such as Hong Kong, New York, Dubai, London, Milan, Geneva, and Paris.